This pleasant, isolated cottage which catches the full sun is in Sicily, less than 300 metres from the beach (one of the most beautiful on the island). 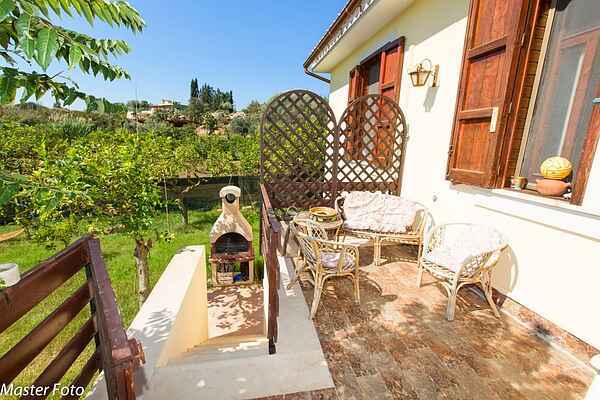 It has a terrace and a private garden in which typical Sicilian lemon trees are growing. It is situated more precisely in the village of Noto Marina (in the south-east of Sicily), where you will find a number of shops, restaurants, etc. (easily accessible even on foot). Several of the surrounding places (within a radius of 6 to 40 km) are worth a detour: towns displaying the Sicilian Baroque style of architecture (Noto, Modica, Palazzolo, Scicli, Ragusa, Catania), major archaeological sites (Syracuse, Eloro, Megara) and the natural parks (Vendicari, Cava Grande di Avola, its canyons and lakes, not forgetting Pantalica). This is the ideal destination for families who like to keep themselves to themselves: you can enjoy the sunshine in peace and quiet and visit the cultural, artistic and historical sites in the surrounding area. On request: bikes (for hire), baby sitter, tourist guides. Prices to be discussed on-site with the owner.